Janice Kaplan, Janice Kaplan is a bestelling author. 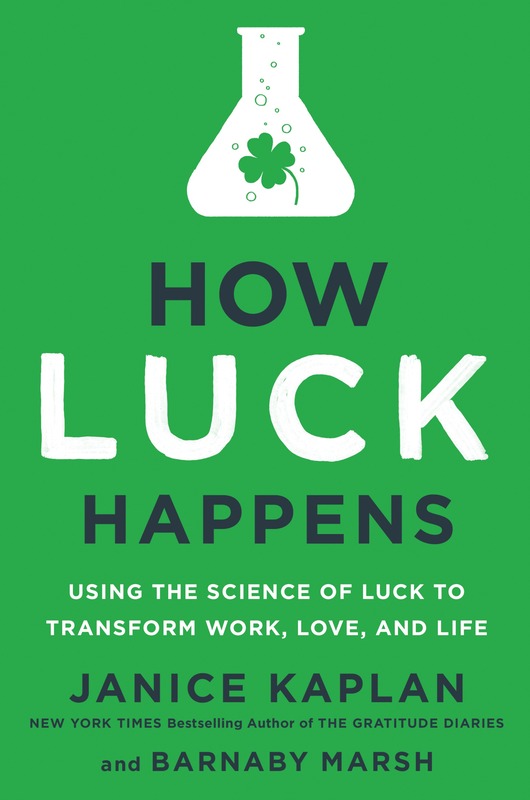 Her new book, How Luck Happens: Using the Science of Luck to Transform Work, Love and Life, is out from Dutton now. A reasonable investment plan would have you put some money in bonds and some in stocks (and maybe a little bit in commodities), and if one portion goes down, another portion probably balances it out. The nice, safe, diversified strategy is also the one that can make you feel lucky when you’re able to retire to Palm Springs and sip a mai tai cocktail while lounging on your deck. From every rational perspec­tive, having many eggs in your basket (or many different baskets) sets you up to be lucky. You have more opportunities for success. If you break one egg, you still have several others, smooth and shiny and ready to go. But come on, now, admit it. That cautious approach doesn’t inspire much excitement. We live by the Amer­ican legend that you go big or you go home. We’ve all watched Who Wants to Be a Millionaire? (and endless other similar game shows), where the more you risk, the luckier you can get. If you really be­lieve in something, you put everything you have into it. Exactly. A few years after Fred Smith graduated from Yale, he had the crazy idea for an overnight delivery service. He raised many millions for the company, which he started in 1971, but over the next couple of years, fuel prices started going up and the company’s finances went down. On the verge of bankruptcy and millions in debt, he made a last- gasp pitch for financing to the board of General Dynamics— and got turned down. Smith had $5,000 left in the bank. Give up? Nope. He flew to Las Vegas and played blackjack all weekend with the last of the company’s money. He made $27,000. On Monday morning, the se­nior vice-president of operations was stunned to see the money in the bank. Terrific! It was enough to pay fuel costs for the week. He asked Smith where the money had come from— and heard about the big gamble. “You mean you took our last $5,000? How could you do that?” asked the senior vice- president, stunned. Smith pointed out that it really didn’t matter. The $5,000 wouldn’t have been enough to keep them aloft for the week, so it made sense to risk it. He’d had the courage to put all his eggs in the blackjack basket and win. Now that’s a story! Bet everything you’ve got— and create a com­pany called Federal Express! Shortly after the gambling weekend, Smith raised more money— to the tune of eleven million dollars— and was able to keep going. A few years later, the company was profitable, and it became so successful that Smith is personally worth close to five billion dollars. And you have no doubt gotten a FedEx package delivered to your door sometime recently. But the truth is that Fred Smith didn’t make himself lucky with that one weekend of gambling. He had been building the founda­tions for his company for years. As an undergraduate, he wrote a paper for an economics class about automation and transportation and how you could deliver stuff by small planes. He later joked that he didn’t remember his grade but guessed it was probably his “usual C.” After he graduated from Yale, he spent three years in the Ma­rines, flying in planes (though he wasn’t a pilot) and learning mili­tary logistics. All that helped when he started what was then Federal Express. By the time of the Las Vegas story, Smith’s innovative Federal Express was already flying eight planes and gaining a lot of at­tention. The $27,000 might have felt nice that Monday— but what really mattered was the $11 million he pulled in shortly after­ward. The notion of gambling it all in Vegas makes an excellent fable, but it clearly wasn’t the only option he had for saving his company. If you want to be lucky, you have to both throw yourself fully into the moment and also be pre­pared for the future. That takes a couple of eggs and a couple of baskets— and just might be the formula for a lucky life. From How Luck Happens by Janice Kaplan and Barnaby Marsh, published on March 6 by Dutton, an imprint of Penguin Publishing Group, a division of Penguin Random House, LLC. Copyright (c) March 6 by Janice Kaplan and Barnaby Marsh. Janice Kaplan has enjoyed wide success as a magazine editor, television producer, writer, and journalist. The former editor-in-chief of Parade magazine, she is the author of thirteen popular books including the New York Times bestseller The Gratitude Diaries, which received international praise. She has appeared regularly on network television shows and lives in New York City and Kent, Connecticut.